Currently Sunbird property will be undergoing repairs due to damage caused by Hurricane Michael. Pools are currently closed we are unsure if they will be open during 2019 spring and summer season. We do have one direct beach access open. If pools are important to you this may not be the best fit right now. If you are wanting a nice place to stay with an amazing beach/sunset view you will find the This property acceptable at this time. I will update with any new changes as they are received. Parts of the property are closed off and parking may be limited depending on what is going on with repairs. At this time this property is most suitable for 1 or 2 adults in town for work needing a clean place to sleep with a great view. Due to lack of amenities and anticipated construction It is not suitable for vacationing families with children at this time. For a great vacation experience please check my other beachfront property for price and availability which is only 1/2 mile away from this one. www.vrbo.com/12254. Enjoy sugar white sands at our Beach front 9th floor unit with amazing views. And yes we are right on the beach!! Includes dedicated high speed internet in unit. Relax on the World's Most Beautiful White Beach, Panama City Beach, Florida. beach front unit is on the 9th floor in the West Tower and offers accommodations for up to a maximum of 4 people 2 adults and 2 children. Brand New Queen size Pillow top. Unit has dedicated high speed internet. The unit is clean,refreshing and enjoyable! The unit has a great panoramic beach view. There are 3 swimming pools one of which is heated November 1st through April 1st. Amusement parks, golf, night clubs, and fine dining are located near by. Located steps from dining and right next to Pineapple Willey's and Pier Park Mall is only 6.5 miles away. Property is near Ripley's Believe it Or Not'. Spring and Summer weekly rates run from Saturday to Saturday. There is a 3 night minimum to rent this unit. You Must be at least 25 YEARS OR OLDER TO RENT THIS UNIT the person who rents unit is responsible for the unit and must reside in the unit for the entire stay. See house rules. No subletting allowed, you may not rent this unit for someone else with out owner approval. Thank you for your interest and for visiting our site. To get an instant quote please click on the get an instant quote link to the right. Please tell me a little about your situation and other guest who will be staying with you in the unit. If you would like to reserve the unit please click the contact manager link. Please understand that availability and pricing can change quickly until the unit all fees have been paid. We chose this property after vacationing in 2003 and fell in love with the white sandy beaches and clear blue water. Panama City Beach has some of the worlds prettiest beaches. I love to visit as much as I can and enjoy helping others do the same. 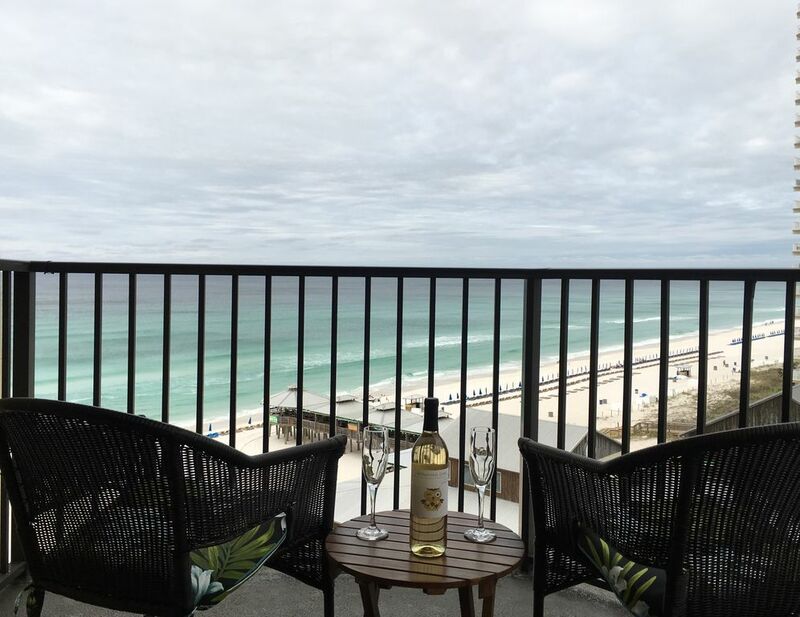 The condo is right on the beach and perfect for family's or couples. (Pools temporarily closed due to damage from Hurricane Michael)There are 3 refreshing pools to choose from. We are right next door to Pineapple Willey's. We are in a great location and close to everything. Signal Hill Golf Course .8 miles away. Directly on the Beach with great sunset and beach views! New Coin operated Front load washing machines next to elevators on ground floor! Dedicated high speed wireless internet provided password provided on check in. 4 bath towels, hand towels and wash cloths. Fitness room is located near tennis court. Located right on the beach! Amazing views from this unit. Watch beautiful sunsets right off of the Balcony. pull out queen sofa sleeper with linens provided. Glass stove top with oven. Counter top stainless steel microwave. New 39 inch flat screen TV in living room New 32 inch flat screen TV in bedroom. small portable CD/Radio player in unit. Private balcony, no grills allowed on balcony. Wood decks located around pool. Jet ski Rentals Available private vendor. (3) 3 pools one of which is heated during the winter months. 2 new Flat screen televisions with cable, new pillow top mattress recently purchased. Fully equipped kitchen including new Microwave, refrigerator, stove, poolside charcoal grill available, Private balcony with great view of beach and sunset, Three pools (one heated seasonally), Coin Laundry available on ground floor New front loading machines just purchased $2.50 to wash $1.75 to dry. Close to shopping. Walkway to pineapple Willey's Restaurant and Near Super Walmart and Ripley's Believe it or not.